Johann Peter Schweigert, from Ansbach in western Bavaria, was a grenadier in Company 5 of the Ansbach Regiment, which was "rented" to King George III, along with the Bayreuth Regiment, in 1777 to augment his British Army in quelling the revolt in the American colonies. These regiments were part of the Cornwallis army that was captured at the surrender at Yorktown. The prisoners, including the "Hessians" were imprisoned at Winchester, Virginia while the peace negotiations were conducted in Paris, France. (Note that my ancestor Philip Wendel served as a guard of these prisoners.) After conclusion of the Treaty of Paris, in the spring of 1783 the prisoners were marched to New York, to be boarded on ships for return to England or Germany. Not all of the prisoners made it back to New York. Not only was there a substantial German-speaking immigrant population in the Winchester area of the Shendandoah Valley, but going north through Maryland and Pennsylvania would also entail passing through areas with "Pennsylvania Dutch" German-speaking populations. For obvious reasons, the exact time, location, and means by which some of the "Hessians" escaped into the local populations was never recorded, but it appears that Peter Schweigert lived first in Maryland, where he married (we don't yet know his wife's name) and started his family, then in Somerset County, Pennsylvania where more children were born, and finally migrated west in 1808 to Beavercreek Township, Greene County, Ohio, where he died in 1839. 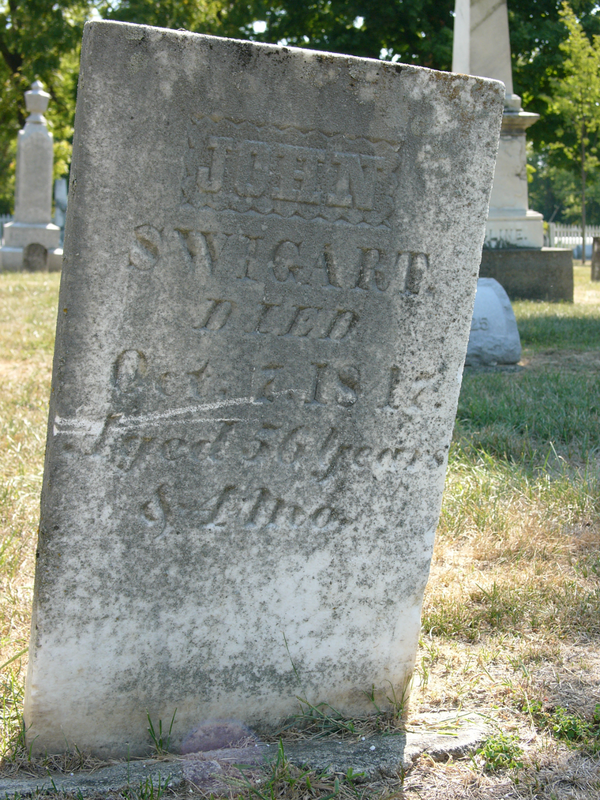 My wife is a descendant of Peter Schweigert's son, John Swigart (headstone photos below), who died in Beavercreek Township in 1847, via John's daughter Susan Swigart who married John Hugh Stewart. So, my German-speaking ancestor Philip Wendel guarded my wife's German-speaking ancestor Peter Schweigert in the early 1780s, in Virginia, 170 years before we were both born in Ohio! 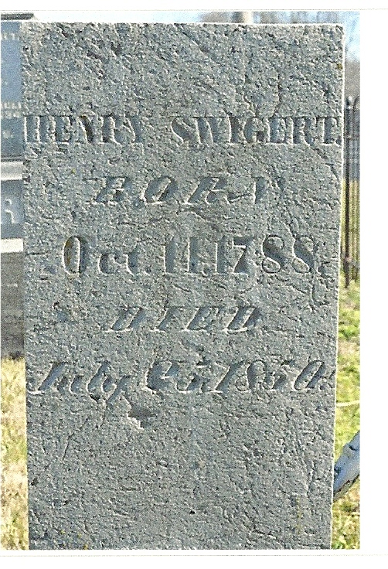 Headstone of Henry Swigart, at the Mt. 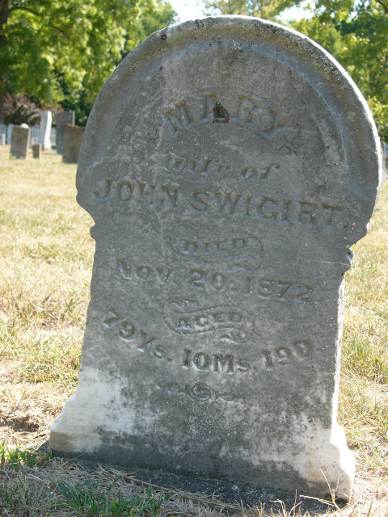 Zion / Shoup Cemetery, in Beavercreek Township, Greene County, Ohio. Headstone of Mary Krise (I think her maiden name was a German name, perhaps Kreise). 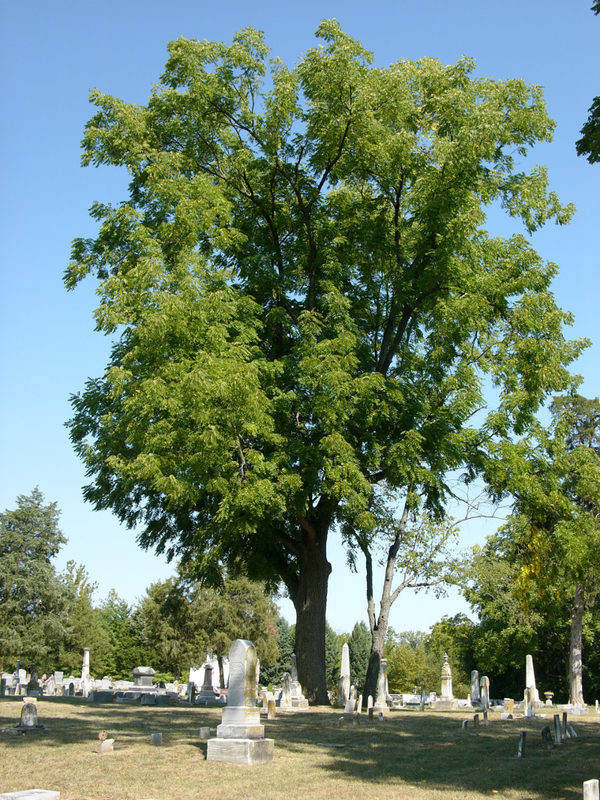 This is the largest Black Walnut tree I have ever seen -- it is in the Beaver Reformed Church cemetery in Beavercreek Township, Greene County, Ohio, where John and Mary Swigart are buried.